But I’m very bored at home.. I had to look for a recipe that I already have all the ingredients and I found one! I posted this picture on Facebook, people want to know the recipe, so here I am to share with you guys! Click here to check my Facebook fan page! 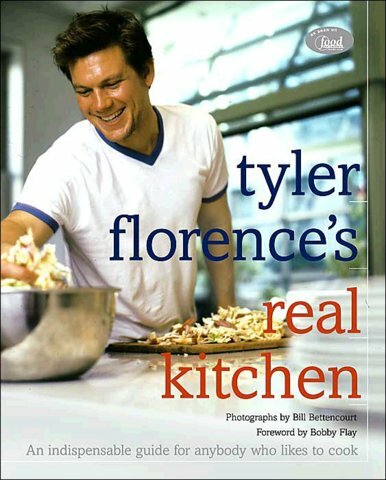 It’s from Tyler Florence’s Real Kitchen. I got this book as a Christmas gift from my mother in-law. This indispensable chocolate cake is perfect for every birthday. Preheat the oven to 350 degrees. Coat two 9-inch round cake pans, including the sides, with nonstick cooking spray. Cut 2 circles of parchment paper to fit the pan bottoms and place them inside the pans; then spray the paper for added nonstick insurance. Set the pans aside. In a large bowl, sift together the flour, baking soda, and salt; set aside. In the bowl of an electric mixer, cream the butter and sugar until light and fluffy. Add the cooled chocolate and beat for 3 minutes to incorporate. Beat in the eggs one at a time; add the vanilla until well blended. Scrape down the sides of the bowl and beat for another 3 minutes. Gradually mix in the dry ingredients in 3 batches, alternating with the ice water. Beat for 1 minute after each addition to incorporate the ingredients and strengthen the cake’s structure. Mix until the batter is smooth. Pour the batter into the prepared pans and smooth the surface with a spatula; the pans should be two-thirds full. Place the pans on the middle rack of the oven and bake for 30 to 35 minutes, or until a toothpick inserted in the center comes out clean and the cake springs back when touched. Cool the cake in the pans until completely cool, and I mean completely cool. Otherwise you run the risk of these extremely light cakes breaking apart when you take them out. Once cool, turn them out from the pans and remove the parchment paper. Next prepare the frosting. In the bowl of an electric mixer, dissolve the confectioners’ sugar and water at low speed. Add the cooled chocolate and vanilla. Mix until everything is completely Incorporated. with the mixer still running, add the butter 1 Tablespoon at a time. Using a spatula, fold in the chocolate chips. With a metal spatula, spread about 1/2cup frosting on top of one of the cakes. Carefully place the other layer on top. Frost the top and sides of the cake thoroughly. Refrigerate the cake for 45 minutes before decorating or cutting. 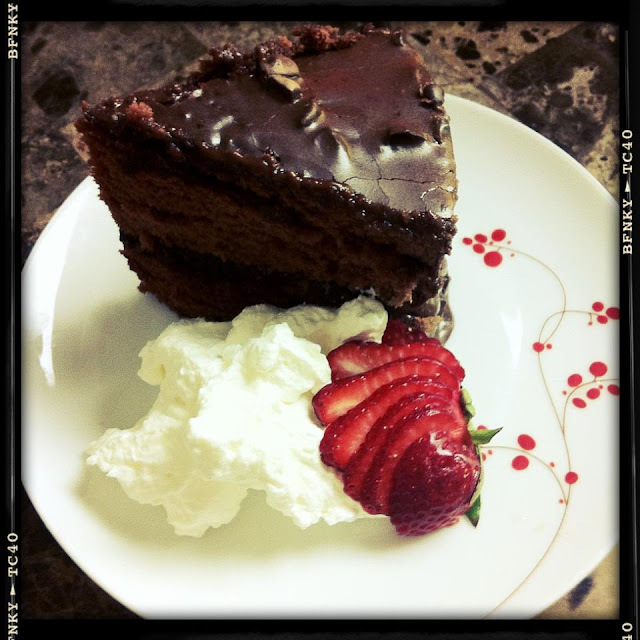 It is a delicious chocolate cake!!! I served with whipped cream and strawberries because I thought it would be light and refreshing! I melted unsweetened chocolate in microwave for 30 sec, and it worked fine. I also did to my butter because I couldn’t wait. lol I microwaved for 10sec. I didn’t have mini chocolate chips so I cut my dark chocolate chips. I hope you guys try it out and tell me how you liked it!! I’m pretty sure they will love it!! Feels like cooking and cooking! !